I don’t normally write blogs, but last week I did a poll on my insta story asking if anyone would be interested in hearing about our surf trip to The Algarve. I was really surprised that the majority of you were actually keen to see something, so I’ve put together some highlights and a bit of information for any of you thinking about visiting Portugal for a surfing holiday. I’ve called the blog “Simply Portugal” because it is just that! Its not about the outfits and bikinis I wore or the boards I rode or even any accessories that I took (you will have seen me posting about these already ha ha! ), no, this is just about everything else but those things. Last year we flew for 9 hours and clocked up 2 days travelling to fly to Barbados. The weather was intense; one minute it was blazing hot sunshine and then the next minute you’d be caught in a torrential downpour AND we only scored one mediocre surf during our whole two weeks!! This year it took us 10 minutes to drive to Newquay Airport, a 2 hour flight with Ryanair and we experienced the most beautiful blue skies, temperatures maxing 27 degrees daily, pine forests, fishing villages, mountain drives and, most importantly, consistent surf spread over around 10 different beaches! We landed at Faro Airport just before midnight and instead of fussing around with hire cars late at night, we’d arranged for a transfer to take us straight to our accommodation in Sagres. The drive was about an hour and 20 mins. and the journey actually went pretty quickly as the roads were so quiet. Sagres itself is located in the extreme southwest of continental Europe. Its exposed to the Atlantic Ocean (making it necessary for wetsuits – I took my 4’3) and influenced by Mediterranean currents. The coastline and surroundings of the Village are made up of breathtaking rock landscapes with hidden caves, canyons, wide golden sandy beaches and powerful waves (made for surfers!!). f you want to experience wild nightlife and busy bars, then Sagres is not for you (check Lagos instead)!. Sagres is a peaceful but thriving fishing village with a small Harbour, lots of rustic cafes, shops and traditional Portugese restaurants scattered up and down two main streets and various little backroads. There’s also one really large Supermarket (Intermarche) which sells everything including the most incredible selection of fresh fruit and vegetables that I’ve ever seen along with freshly made bread, fresh fish and a huge counter filled with organically farmed meat – perfect if you’re self catering (like we were). Hiring a car is definitely a must by the way, especially if you want to explore. We used Luz Car in Lagos as there’s no hire facility in Sagres. Luz were pretty good as they delivered the car to our Villa (free of charge) first thing on Monday morning and were pretty chilled about who the drivers were. We also had the option of returning the car straight to the airport at the end of the two weeks which meant we could make the most of our last day. Fuel was relatively cheap too. We had a diesel van and it took around Euros 70 for a full tank, which lasted us the whole two weeks! Knowing that there were apparently 22 different surfing beaches to explore in the Algarve made it necessary to do a bit of research. 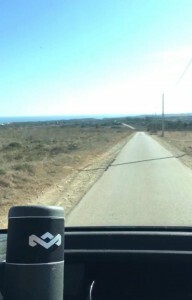 One of the reasons we had chosen to stay in Sagres is because we heard one of their local beaches Tonel worked for shortboards and longboards. This was the first beach we headed to and weren’t disappointed with the surf. However, it was pretty big on the first day, and me and my sister let the boys go in and show us how it was done, while we could sit and sun bathe with the snack bar right on the beach. The next day we decided to go for a dawny and went to check Tonel AND its like it just knew we arrived… PERFECT 3-4ft clean off shore, and the best thing about it was there was no-one else around! We stayed in for a few hours, jumped out for a late breakfast and headed back in again all afternoon.. what could be better? I’m not joking when I say this, for the first week of the holiday it was like this every day. Can you believe we even got bored of surfing the perfect empty waves? Curiosity getting the better of us – could it be all the breaks were this good? – we went in search of the next perfect location…….. This is the main beach in Sagres village and can get quite busy. The great thing I noticed about the Algarve is that all beach car parks are free! Mareta is no exception and this became possibly our favourite spot. It worked really well at low tide in the morning or from around 5pm onwards. It was particularly good waves for Longboarding to the left of the beach and bigger sets to the right for the shortboarders… We used to hang out here messing around in the shorebreak while the tide was high and at the end of the day, normally managed to get a few sunset surfs . An hour and a half drive took us up through pine clad mountain roads to this north west surf spot in Arrifana.. Arrifana is a long sandy beach situated in a chilled little village. The only problem was we chose a Sunday to visit and this meant the beach was pretty crowded with locals and holidaymakers. To get down to this beach was a bit of a problem too as it’s a very steep hill which takes about 10 minutes on foot. However, there was a cool little tuc-tuc that took passengers backwards and forwards and even had a convenient place to store your board – probably your best 1 Euro ever spent!. The surf here was fun and was suitable for us all. At the end of the day we headed up to the Sea You Surf Café for a healthy drink and one of their amazing acai bowls. Arrifana could definitely be on our list of places to stay next year! THANKS PORTUGAL FOR THE BEST HOLIDAY!